THE PSYCHOLOGY OF STEAMFUNK: Personality Types and Temperaments and Archetypes, oh my! Speculative fiction in general – and Steampunk in particular – offers us something different: a sense that the world is larger and more filled with possibility than we might be able to imagine; a sense that increasing the opportunities of other people’s lives does not mean diminishing our own. Steampunk is a reminder that our vision is bigger than our histories; that by looking back at yesterday and learning from it, a better tomorrow is still an option. Most of us believe we discovered Steampunk at random. We loved the genre before it was called Steampunk and we kind of just stumbled into the Steampunk movement. All actions follow a process – Perception à Thought à Impulse à Action – thus all actions are purposeful…and anything with a purpose, or direction, can be predicted. 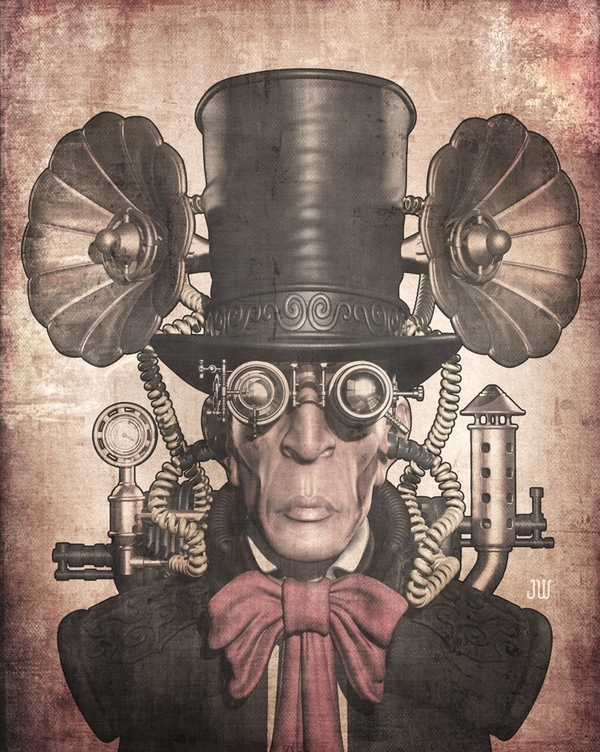 How could we know we would gravitate toward Steampunk? That we would write it? Read it? Wear it? By knowing and understanding our Personality Type. People read fiction to enjoy a world that is not their own; to live tangentially and vicariously through someone else. People read fiction to be informed, to be entertained and to escape from everyday life. Reading is an escapist hobby, but science fiction and fantasy reading are even more so, for readers of speculative fiction escape out of their own worlds into places and times that either no longer exist, do not exist just yet, or never will exist at all. So, why do I read science fiction and fantasy? Why do I write Steampunk and Sword & Soul? The answer may very well lie in my psychological makeup. Recent studies show that my temperament predisposes me to a love of science fiction. According to the Keirsey Temperament website, “Rationals are very scarce, comprising as little as 5 to 7 percent of the population.” NTs are non-conformist critical thinkers. The NTs idolize the science fiction writer as the real architect of change. They can see the cleverness and competency in science fiction. Rationals excel in any kind of logical investigation such as conceptualizing and theorizing – excellent tools for reading and writing Steampunk and other speculative fiction because Science fiction readers require a willing suspension of disbelief to enjoy the material, as well as the ability to conceive and extrapolate beyond what the writer has written. Writers of Steampunk require the ability to conceive and extrapolate a retrofuturistic past and from it, create an entire world. Speculative Fiction – often called the literature of ideas – is not just about fusion, automatons, dragon-slayers or airship pirates; it is rooted in the same ideas of love, anger and the human heart in conflict with itself that drive romance, drama, tragedies and contemporary fiction, but is presented more fantastically and thus, made new. Even stories about humanoids battling non-humanoid alien races on a distant planet in the far future boil down to human feelings and human thoughts that we all can relate to. Personality Type or Psychological Type are terms most commonly associated with the model of personality development created by Isabel Briggs Myers, the author of the world’s most widely used personality inventory – the MBTI or Myers-Briggs Type Indicator. Myers and her mother, Katharine Briggs, developed their model and inventory around the ideas and theories of psychologist Carl Jung, putting Jung’s concepts into a language that could be understood and used by the average person. In her studies of people and extensive reading of Jung’s theories, Myers concluded there were four primary ways people differed from one another. She labeled these differences “preferences” – drawing a similarity to “hand preferences” to illustrate that although we all use both of our hands, most of us have a preference for one over the other and “it” takes the lead in many of the activities in which we use our hands. The first set of mental preferences relates to how people Perceive or take in information. In the Myers-Briggs Type Indicator – MBTI Personality Type Code, this is the second letter. Those who prefer Sensing Perception favor clear, tangible data and information that fits in well with their direct here-and-now experience. In contrast, those who prefer Intuition Perception are drawn to information that is more abstract, conceptual, big-picture, and represents imaginative possibilities for the future. The second set of mental preferences identifies how people form Judgments or make decisions. In the Myers-Briggs Type Indicator – MBTI Personality Type Code, this is the third letter. Those who prefer Thinking Judgment have a natural preference for making decisions in an objective, logical, and analytical manner with an emphasis on tasks and results to be accomplished. Those whose preference is for Feeling Judgment make their decisions in a somewhat global, visceral, harmony and value-oriented way, paying particular attention to the impact of decisions and actions on other people. There are two other mental preferences that are part of the MBTI Myers Briggs model: Energy Orientation – the dimension of personality known as Extraversion or Introversion – and Outer World Orientation – the style or orientation one uses in dealing with the external world: Judging or Perceiving. Energy Orientation pertains to the two forms of Energy Consciousness each of us experiences on a daily basis. We occupy two mental worlds: one is inwardly turned, the other is outward. One of these worlds is our primary source of energy; the other secondary. In the Myers MBTI Personality Type Code, this is the first letter. Outer World Orientation relates to which mental preference one relies upon in dealing with – and relating to – the Outside World. When this leading function is one of the two Judging mental preferences, then this orientation is called Judging. When this leading function is one of the two Perceiving mental preferences, then this orientation is called Perceiving. In the Myers MBTI Personality Type Code, this is the fourth letter. Those who prefer Judging rely upon either their Thinking or Feeling preference to manage their outer life. This typically leads to a style oriented towards closure, organization, planning, or in some fashion managing the things and or people found in the external environment. The drive is to order the outside world. While some people employ an assertive manner, others’ “ordering touch” – with respect to people – may be light. Those who prefer Perceiving rely upon either their Sensate or iNtuitive preference to run their outer life. This typically results in an open, adaptable, flexible style of relating to the things and people found in the outside world. The drive is to experience the outside world rather than order it; in general lack of closure is easily tolerated. The roots of Keirsey Temperament Theory are based in many years of research and innovation by Dr. David Keirsey. At Pomona College and the Claremont Graduate School, Keirsey began his research and study of human behavior. As he researched historical literature in psychology, philosophy, and the sciences, he became intrigued by the patterns of four temperaments. These four distinct patterns of human behavior were woven throughout history, dating back to such figures as Hippocrates, Plato and Aristotle, who learned these patterns from even older Egyptian knowledge from the Egyptian Mystery Schools. In the 1950’s, Dr. Keirsey began putting his theory into practice as an Educational Psychologist, where he developed techniques in training and coaching. For more than two decades, he served as a consultant to both educators and psychologists, with continued research and innovations in his theory of the four temperaments. In the early 1970’s Keirsey introduced his theory as an educational curriculum at California State University, Fullerton, where he served on the faculty, and eventually chair, in the department of counseling for ten years. The impact of Keirsey Temperament Theory has been lasting and substantial. In the early years, his theory was first put to use by psychologists, educators, and faith based organizations. Are there associations between professional writers’ personality types and the genres in which they write? Surveys of professional writers have pointed to at least one significant association: Poets tend to identify with a perceiving style while fiction – and non-fiction – writers tend to identify with a judging style. Interviews support this notion, with an articulation that poets did seem to be set apart from other writers in some way. Personality type may seem an abstract and unnecessary thing for writers to be concerned about. Yet, personality type is something writers should know, in order to construct novels that sell. How so? 2. Your personality type is intrinsic to who you are and is expressed in your writing. 4. Your characters have personality types. Creating a personality type profile for your main characters can help you create characters that readers will love, hate and / or empathize with. Thinking: Thinking types enjoy logical, fact driven content; intellectual puzzles; and intellectual, mind-bending thrillers. Thinking types want pared down writing with no fluff. Sensate: Sensates enjoy reading fiction and non-fiction about the real world, power, politics, action, sports. Sensates are your thriller, suspense and action market. Feeling: The Feeling type is the women’s lit, chick lit and romance market. Intuitive: Intuitives enjoy reading sacred texts, books about spiritual experience and spiritually-themed fiction, such as The Da Vinci Code. This is also your science fiction and fantasy market. The personality types for the Steampunk Archetypes are not set in stone. They are merely guidelines to help in your writing and / or cosplay. You can take your Myers-Briggs Test (or take it for your main characters) here: http://www.mypersonality.info/personality-types/. Oh, and in case you’re wondering…I am an ENTJ! Posted by Balogun on April 2, 2015 in Afrofuturism, Panel Discussion, Science Fiction, Speculative Fiction, Steamfunk, Steampunk, Uncategorized and tagged personality types, psychology, steamfunk, steampunk. I received an e-mail notification yesterday about you subscribing to my blog (www.rsquaredcomicz.com). Thanks! Since I switched from wordpress.com to wordpress.org and changed by hosting service, I’m asking subscribers to visit my blog and subscribe via e-mail or RSS feed that way. I just want to make sure I’m able to keep track of my subscribers, and to make sure that they are actually being updated on the posts. P.S. You have some interesting stuff! I like the psychology angle, lol. Wow, that’s a pretty comprehensive blog post. Thanks! Thank YOU, for your comment! I was not able to find a Steampunk Archetype for every Personality Type, however I encourage others to come up with their own and share them with me and I will add more as my research uncovers it. Thanks, so much for commenting! What about INTJ-Evil genius military general? Great! I am glad you found it helpful!! Thanks, Sister Valjeanne! I had fun writing this blog. What about ISTJ and ISFJ? And I really wish this test took into account what I call myself, an “extroverted introvert”, someone who has learned or is extroverted in some situations, is introverted in others. May of us are extroverted at times and introverted in others, thus the percentage value for the types. I am an extrovert, however, I often like peace, quiet and solitude, especially when I write.